A trend in my life the past few years is being asked by film marketers or producers to pre-view films with the idea that I will help promote them. They are most often films with a pro-life or Christian message that seek to appeal to mainstream audiences. There have only been two that I have actually promoted with full force, diving in to help not because I get anything out of it, but because I was so moved and inspired, I couldn’t help but speak up on their behalf. The first movie was Bella which ended up winning the Toronto Film Festivals People’s Choice Award and the second I just viewed last week called October Baby which will be released on March 23, 2012, just a few weeks from now. October Baby made me laugh, cry, laugh again, cry again, and then pierced me to the core with its outstanding portrayal of heroic forgiveness. It exceeded all of my expectations! It was done so creatively that I could not have guessed the story-line. I fell in love with the main characters. There was also great acting in it! And, I don’t just mean there was great acting for a “Christian movie,” I mean there was great acting as if it was just a normal movie done by famous Hollywood producers. I ended the screening wanting more. That hasn’t happened to me in a long time. I was wishing for a sequel wanting to know what was in store next for the main actress and actor. Without giving too much away, I will tell you that this is a story of a college student on a quest to find her birth mother after discovering she is adopted. I encourage you to view the trailer at http://www.octoberbabymovie.net/. 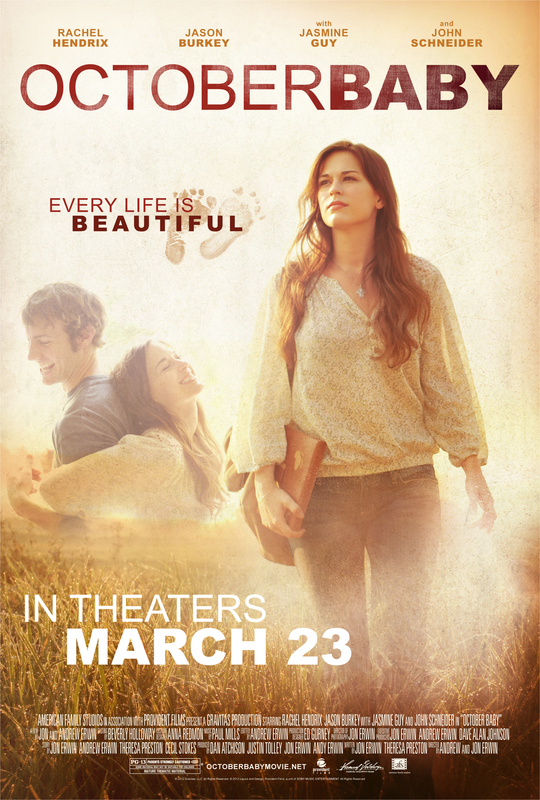 I believe this is a movie anyone can watch whether pro-life, pro-choice, Christian or not. I’m tired of the trashy movies that Hollywood puts out that have no real messages and especially not ones of hope and courage. If we want producers to start respecting our morality and our desire to watch quality movies, then we MUST show up on opening weekends for films like October Baby where the producers have taken a great risk to allow us to encounter truth and beauty in a film. I invite you to show up on opening weekend or in the weeks that follow to any theater in your hometown that is showing this movie. It may not be at your nearest theater, but I challenge you to drive far if you have to. Show Hollywood that these are the types of movies that matter to you. Invite all your friends and family. Create a group event on Facebook and invite all your friends and see who will join you. Post about the movie to your Facebook friends, to your Twitter followers, and through e-mail in the next two weeks to get people to take advantage of this great opportunity! Buy out a theater for your church, youth group or school. This movie is rated PG-13. I think teens and college-age students will be especially engaged by this film as they will relate to the main characters. Parents will relate to what it is like letting go and allowing your young-adult children explore truth for themselves. I said at the beginning that I am not promoting this film for any gain for myself, but I take that back. What I gain from promoting this film is the satisfaction that I did my small part in helping to build a culture of life and love by promoting a film that stands up for those values. I invite you to do your small part and promote it with me! After you see it, post your thoughts and comments back on this blog. I am excited to hear your impression!